Geneva- With anti-immigrant right-wing parties winning elections in Italy, Hungary and Austria, migrants and refugees are now left to face new risks in these European countries, warns the Euro-Mediterranean Human Rights Monitor, expressing deep concern over plans to expel half a million migrants from Italy en masse. Deportation is not the only problem for refugees fleeing war-torn and poverty-stricken countries with plans to close migrant camps and opening detention centers instead. A new bill already drafted in Hungary will make it hard for advocacy groups to provide assistance to migrants and asylum seekers. Austria has also sharply reduced its quota of refugees for the purpose of restricting their flow and reducing the number of arrivals to the country. These right-wing plans in the three countries mean an unprecedented violation of the Dublin Regulations relating to the status of migrants and refugees in the European Union, and a violation of human rights as enshrined in the 1950 European Convention on Human Rights. While Italy is heading towards forming a new government that includes the far right, a new political document was agreed between Matteo Salvini, the Federal Secretary of Lega Nord known for his anti-immigration attitude, and Luigi de Mayo, leader of the Five Star populist party during a joint meeting held about two weeks ago on Friday, May 18. The document deals with the migrants’ crisis in the country and is expected to take effect following the formation of the government last Thursday. The new document would further deepen the crisis by increasing the number of migrants held in Italy’s detention centers before they are transported to Libya, and by maintaining the already established detention centers where migrants have been suffering from inhumane conditions that only add to their plight. 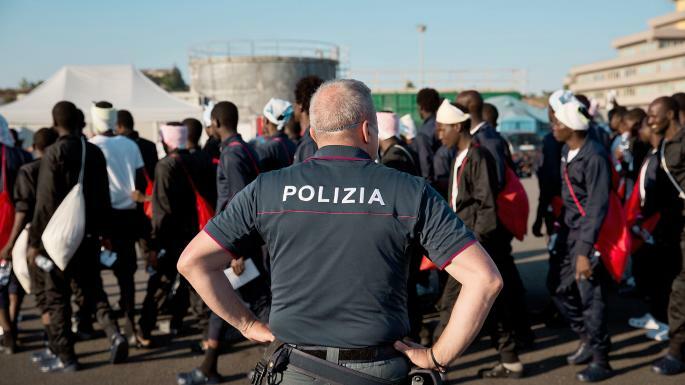 The most dangerous part of the document is that it threatens Italy’s recognition of the Refugee Convention “Dublin Convention”, whose content invitingly calls for Italy's evasion of responsibilities towards refugees as guaranteed by the Convention. Shortly after his re-election for a new term last April, another plan in Hungary was submitted by the government of Hungarian Prime Minister Viktor Orbán, to criminalize any assistance provided to migrants and asylum seekers in the country. Violators, whether groups or individuals, are expected to serve a full year in prison as a result. Passing such a law would constitute a clear and explicit assault against the fight for human rights and the work of humanitarian organizations assisting refugees in the country. It only adds a heavy burden on asylum seekers and migrants, said Sandra Owen, a Euro-Med policy researcher. The “Stop Soros” bill was drafted in response to the activities of the Hungarian-American businessman George Soros, funding a number of human rights organizations involved in assisting refugees. The bill is aimed at tougher asylum policies and border security measures to prevent refugees from entering Hungary. It also explicitly opposes European resettlement programs aimed at distributing refugees between all European countries as part of the refugee quota system. These arbitrary policies are not the first to be taken by Hungary. The country has already been following a strict policy with migrants since 2015, beginning with the establishment of a border barrier blocking their entry. Migrants who managed to illegally make it to the country are subject to prison sentences up to five years. Austria adopts a discriminatory policy towards residents in its territory, with migrants being paid a maximum of 563 euros per month, while Austrian citizens receive an amount of 863 euros per month. In order for refugees to obtain the equal amount, they have to spend at least five years in the country and pass the German language exam. The plan was designed as part of the electoral program of Sebastian Kurz, the country's foreign minister, who pledged to reduce the number of refugees and to close migration routes to Austria, and Europe as a whole. Sandra Own said that the international community should take deterrent legal measures for such schemes that add more suffering to the refugees in Italy, Austria and Hungary. The governments of these countries should fulfill their responsibilities towards refugees and stop their discriminatory policies against them. Euro-Mediterranean Human Rights Monitor calls for curbing calls of hatred and racism against asylum-seekers and migrants and taking a decisive stand against the violations of refugee and migrant rights, following a wave of extreme right-wing attitudes in Europe. Euro-Med Monitor also calls for the protection of refugees as stated in the Dublin Convention and the European Convention on Human Rights.